NOW Electro Enduranceâ„¢ - 2.2 lbs. 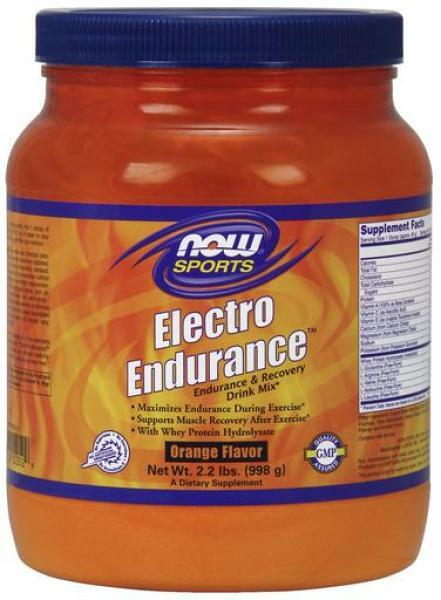 NOW Electro Endurance™ - 2.2 lbs. During exercise, the body loses water and minerals (electrolytes), and glycogen (carbohydrate) stores are depleted. In addition, muscle tissue is being stressed. Scientific studies have indicated that post-exercise nutrition can be critical for optimization of electrolyte replacement, muscle recovery, restoration of glycogen stores, and ultimately for maintaining performance and endurance. According to research, immediate replacement of minerals and carbohydrate, when combined with easily assimilated protein maximizes amino acid uptake into muscle cells, thereby helping to prevent the onset of fatigue. Other Ingredients: Organic Brown Rice Syrup Solids (complex carbohydrate), Dextrose, Fructose, Rice Maltodextrin, Citric Acid, Malic Acid, Natural Orange Flavor, Natural French Vanilla Flavor, Orange Juice Powder, Annatto Extract and Natural Citrus Flavor. Contains milk and soy derivatives. Suggested Usage: For best results, mix 1 scoop (45 g) of Electro Endurance™ with 8 to 12 fl. oz. of water or your favorite beverage before, during, and after your workout. To further enhance your nutritional goals, try combining Electro Endurance™ with NOW® Branched Chain Amino Acids, Creatine and Ribose. NOW® Electro Endurance™ is the perfect supplement for all athletes seeking endurance, recovery and ultimately PERFORMANCE! Contains no: salt, yeast, wheat, gluten, egg or shellfish.